As tales go, this is not exceptional large, but it is good and has a great moral. Thus, I believe it is worth the telling. We wanted to get some beach and sunset pictures during our vacation, so naturally we went to Galveston Island. Upon arrival, we quickly figured out that we were not going to be able to get a sunset picture from any of the beach side of Galveston Island. It faces south and the sun has yet to set in that direction. Thus, throughout the day, we looked for an alternative. The other side of the island faced the right direction along certain parts of it, but everything we looked at was private land. Finally, near Freeport, we found a small piece of land not private, and I got set up to photograph the sunset. 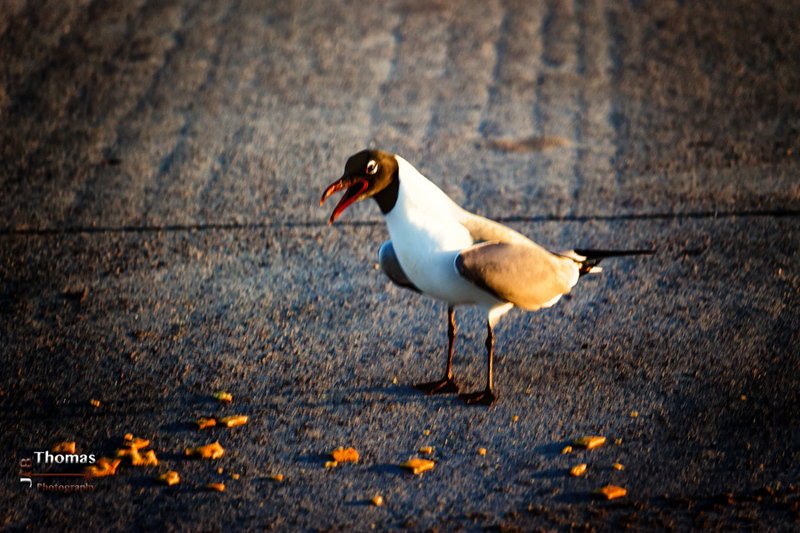 As time grew on, I got bored and decided to see if I could get me some pics of seagulls in the area. I must confess I had to resort to bribery to get the pics, but it was interesting how it played out. I decided to throw onto the ground some cheese crackers I had left over. I turned to hand the bag of remaining crackers back to my wife, and she says to me, “Honey, you are going to have to throw some into the air.” To which I replied “I don’t think so! Watch and see.” Just as I turned away from her, the first seagull swooped down and landed next to the crackers. What he(she?) did next was surprising. Instead of delving into the large group of crackers, he began to squawk loudly. It seemed almost as if he was proclaiming that the crackers were his. None of the birds listened to this though. In droves they came, and ate his crackers, they did. He continued to squawk at them and they continued to eat his crackers. By the time he finally shut up and ate some crackers, there were only 2 left. He’d wasted his time trying to stop them, and squawking, when he could have had all of the crackers. Moral of this little tale…know when to shut up. In the above photo, he is caught in the act of squawking. Remember that image every time you consider talking and think about what your words will cost you. Have a great day and thx for reading! A young man walked along the path. He knew his destination was not far. There were many leaves blown onto the path before him. They made an almost deafening roar as his shoes smashed them aside and into the ground. The autumn air was brisk and kept him cool as he walked. Although clouds filled the sky, there was still plenty of light to see his path through the forest. The walk was comforting to him and his thoughts filled his mind.Taking him through many familiar lines of reasoning, yet even in this serenity of nature; the answer, the direction remained the same. But he had come to accept this. It was not as if, he had not fought and struggled with himself over it. Many countless nights he had found himself going over it all, in his mind. Like a record that has been played too many times, it just skips, again and again until the end has been reached. Always the same. The path veered sharply right and climbed. He turned with it and his steps became more deliberate and measured. His thoughts turned to his destination. The hill which he ascended too many times in the past. His perch above the town below, this hill that rose above the small town he had resided in, all his life. He had come there many times before. It was a place to think, a place of solitude, of peace and of privacy. Although his reason for coming here this time is not exactly the same as it was in the past, he trusted that it would still hold some of those qualities. The climb up the hillside was going maddeningly slow. The pain in his leg was growing sharper with each step he took. The pain grabbed ahold of his thoughts, the accident that took place six months ago came clearly into his mind. He and a friend were driving home from a game. They were not really going too fast, slightly above the speed limit. Just as they rounded a corner they saw the light they had seen coming around the corner, was from another car traveling in the opposite direction as them, and it was in their lane! His friend startled, quickly jerked the car right. The car crashed through a fence. Then they were in the air…falling. After that he cannot remember. His mother told him later in the hospital, that the car had landed nose first and then fipped end over end, down a deep ravine. He was told that both he and his friend were lucky to be alive. He was not so sure he agreed with that last part. While his friend had suffered only minor cuts, bruises, and some cracked ribs, his injuries were a bit different. He got the cuts and bruises of course, but it was the leg injury that was bad. He lost part of the muscle tissue and was lucky to be able to walk at all. The accident ruined any future career in sports and changed his life forever. His mind moved away from these thoughts as he finally reached the top of the hill. His eyes began to gather in all that he was seeing. A small town, with its shops, boardwalks, streets, and people, lay sprawled out before him. Beyond the town lay fields of green and yellow. A few farm houses and barns could also be spotted. In his mind this was the perfect view of small town America. Simple, serene, and cozy. As he sat down on a nearby stone, he pulled the shiny metal object from his back pocket. Sliding his fingers carefully, almost caressing it, his mind once again sank into his thoughts. The last six months of pain and agony crept into his mind. The times he cried fighting the intense pain to make a single step. The times when he realized, as he lay in bed at night, that he would never run again. The times he cried when he saw that his unspoken dreams would not happen. The pain and the anguish flushed through him. Like poison coursing through his veins. Fiercely, he slipped his thumbnail into the notch of the blade. Then a quick flick of his wrist and the blade of the knife was fully entended. An over-whelming sense of calm came upon him as one thought came to the front. It was clear and its clarity shouted “A life without dreams is not worth living!” This single thought echoed loudly over and over in his mind, “A life without dreams is not worth living!” He could not fight it anymore, he could not find another answer. A tear slid out and rolled down his cheek. He harshly wiped it away and slammed the knife into his wrist. The pain that shot through his arm almost made him pass out. Having been in that accident, he had endured much worse and was able to retain consciousness. Gritting his teeth together he began to rip the knife up his arm. The pain became so intense that he began to scream as he wrenched the knife further up his arm. In all the pain he had not realized the amount of blood that was spilling out of him. It was on the rock he sat on, on his shoes, on the grass. He, for some reason, thought it would have been more red. But it was almost as black as oil. His eyes raised up from the blood on the grass and fell upon his arm. A six inch gash stood out glaringly and blood flowed forth. The knife fell from his hand. He felt kinda sick looking at it. Slightly light-headed also and that made him decide to look away from it. He looked down at the town once more and noticed that the town had a slight orange hue to it. It dawned on him that the sun was setting. ” My last sunset. If only I would have had some dreams worth living for ” he thought. He noticed it was getting darker and then sensed he was falling. He felt a hard pressure on his right side and guessed he must have fallen to the ground. He attempted to get up but nothing happened. The sensation that he was once again falling began to creep up on him and he started to feel colder. It was early morning and our parents were not up yet. But the sun was out and had broken through our window making it impossible to sleep anymore. We wanted to go out, we wanted to eat some breakfast, we wanted to watch cartoons. However, on the weekends my brother and I were not allowed out of our bedroom until our parents got up. They did not want us getting into stuff while they were still sleeping. I guess, with me being 7 yrs. old and my brother being only 6 yrs. old, quite the troublemaker already, they thought it best for both of us to stay in our bedroom until they came and got us up. Not knowing what time it was and having to make the best of this very boring situation, my brother climbed down from his bunk bed. We sat and we talked for a little while, then as usual, my brother got bored and started complaining and I also, was beginning to feel the boredom myself. “I want to go eat!” He whined and I agreed. “I want to watch cartoons” he moaned and I replied ” Me too!”. There was the sound of static and then suddenly there appeared a picture on the my brother’s blanket that hung down from his bed. We both quickly moved a little closer and realized at once what we both were seeing. Cartoons! The morning cartoons were somehow being projected onto my brother’s blanket! We quickly glanced at each other and both of us had this huge grin on our faces. Then we looked back toward the cartoons and moved closer for a better view and realized as we got closer that there was sound also! We both glanced around trying to figure out where the cartoons were coming from. Nothing behind us except for the wall, as the bunk beds were up against the wall. After about a minute of glancing around, we both gave up and just started enjoying the cartoons. Not sure how long we sat there and watched them. A half hour? An hour? Perhaps more. It was not until we heard the footsteps of mom coming down the hall, that my brother jumped out of bed, grabbed his blanket and threw it all the way up onto his bed, just as mom walked into the room. She gave us one of those looks, you know the one that says “What are you up to?” My brother runs over to her and says ” Yaaa Mommy!” and gives her a big ole’ hug. The look passes from her face and we all go on to the kitchen for some breakfast. We never did see the cartoons again. Guess, that is one of those once-in-a-lifetime experiences that you never forget. Never let a wild horse too close to your flowers ! I am unsure as to when this wild white stallion entered my yard. I only noticed him when he started to chase one of my guests around the yard. He was big, strong, and obviously slightly insane, for he gave chase most ardently. My guest after having been chased around the yard a couple of laps finally gained the presence of mind to throw himself through a rather large group of hedges into my neighbor’s yard. At this point, the crazed horse wheeled around in search of other prey and wasted no time in heading toward another one of my guests. This guy ran around a little, then ran up my patio steps toward me. As he ran past me he screamed “Do something!”, then ran past me and jumped over my flower garden. The horse turned and crashed right through my bricked-up flower garden. Apparently, in such a hurry to catch my guest that he had no concern for crashing through my garden wall. My guest ran into my garage and slammed the door behind him. However, I was not far behind him and the horse, having just witnessed my flower garden being destroyed. I reached down and picked up what looked to be a large chunk of glass or maybe even a large piece of ice and was in hot pursuit of the horse. I was so infuriated by what the horse had done, I did not take the time to examine what I had picked up. I reached the horse just as he arrived at the garage and started to turn around. I flung what was in my hand with all of my might at the horse and it hit him broadside and it shattered into pieces. It only took me a split sec for me to realize, I was now the horse’s next target. I turned and ran! I ran and jumped up onto the little remaining of my garden wall, then jumped onto my patio and up the patio stairs. I did not dare look back, nor did I need to, for I could hear the horse’s breath behind me. I ran into the house and slammed the door behind me. Safe at last! Boom! A crushing thud hit the door and startled me.The frame shook with the impact. I took several steps back in fear. I waited…. nothing. No sound came from outside. Hesistantly, I approached the door, still no sounds. I opened the door slowly, peeking out ever so slightly. Nothing. Open the door a little more. Still nothing. Then I happened to glace down and there he was. The horse was laying on my patio, half of him on my patio and half hanging over the edge. He was on the brink of falling off of my patio. I approached him slowly, watching for movement of any kind. I could see he was still breathing but that was all. Must have knocked himself out when he slammed into my door. I was still filled with anger for what he had done to me and there was no way I wanted this bad, evil, crazed horse lying on my patio. So I thought to myself, ” If I kick him hard enough, he should fall onto the ground. After what he has done to me, he deserves it.” With that thought in mind I slammed my foot into the horse. Intense pain racks my body; shooting up through my foot as I realize, I have just slammed my foot into the coffee table and it was all just a dream.